With this post we complete the analysis of Psalm 4. David penned this psalm from the depths of his own stressful experience facing people who opposed him. No one knows the exact circumstances. A mention of “grain and sweet wine” after his opponents had asked, “Who will show us good?” might indicate that it was a time of famine. David responded to pressure with prayer and to wicked people with a command to repent. Multiple chiasms highlight the structure of the psalm and emphasize key concepts. Repetitions help to tie the psalm together in one unified song. This very personal psalm focuses on God, without whom David would have no peace or security and without whom the ungodly have no hope. 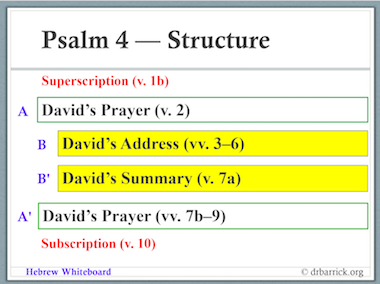 Click on Hebrew Whiteboard to download Psalm 4 or any of the previous studies of Psalms 1-3 and 120-122.